She follows Orla Barry in claiming silver at the Olympic Stadium. 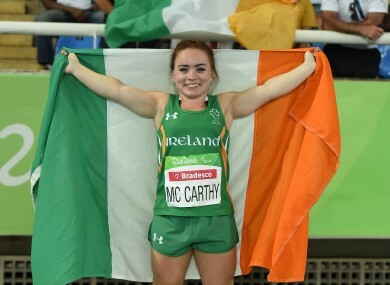 NIAMH MCCARTHY ROUNDED off another stellar day for Ireland in Rio as she followed fellow Cork discus-thrower Orla Barry in winning Paralympic silver. The 22-year-old finished second in the final of the F41 category at the Olympic Stadium tonight as she added a first Paralympic medal to her World Championship bronze and European silver. McCarthy’s performance continues Ireland’s remarkable 24 hours of competition which has seen the overall medal haul jump to nine. The European record holder in this event left her best until the death as she surged into the podium places with a throw of 26.67 metres in her penultimate effort. Tunisia’s Raoua Tlili claimed gold after breaking the F41 world record with a throw of 33.38 metres. Email “Niamh McCarthy wins Ireland's second Paralympic medal of the day ”. Feedback on “Niamh McCarthy wins Ireland's second Paralympic medal of the day ”.